Gary Hochenberger explains the Conestoga wagon to second-graders during their annual visit with the Greenfield Historical Society. School programs like this are made possible through fundraisers like the society’s annual History Day. There will be something for just about everyone, including some new displays, when the Greenfield Historical Society holds its 12th annual History Day on Saturday, Oct. 6. The day will kick off with the historical society’s History Day 5K Run/Walk at 9 a.m. The race will begin at Travellers Rest and the route will take participants past some of Greenfield’s historical sites as it winds its way through town. Runners can register prior to the race at Travellers Rest. Other activities will be setting up while the race takes place and they will open at 10 a.m. They include the Red Barn, Smith Tannery, Grain & Hay Building and the B&O Depot. Outside the Grain & Hay Building, Chris Dodds will be smoking pork loins along with Mike and Kathy Mincey and their cider making demonstration. “Both have been popular in past years. Inside the Grain & Hay will be our quilter and colored pencil painter along with several displays including a display of Greenfield memorabilia collected by Mark Branham,” the society said in a news release. The B&O Depot will feature the Adams Train Display. A flea market will be held on the lawn of the depot. The Smith Tannery will have artists sharing their skills of band box making, painting and woodworking. The Red Barn will have an Ahrens Fox fire truck on display along with the Browder Life Saving Net that was at one time produced in Greenfield, and a vintage firehose cart. A Conestoga wagon and buggies will also be on view. Food for the event will be smoked pork loin sandwiches, bean soup, hotdogs and all the trimmings. Other displays and demonstrations were being worked on at press time. If you are interested in setting up a booth in the flea market, call 937-981-2905 for details. “Come join us for a day of history, food and fellowship,” the news release said. The historical society is also making plans for its annual Ghost Walk in the Old Burying Ground behind the Travellers Rest to be held on Monday, Oct. 8. “Shirley Shields has worked hard over the past year researching the pioneers buried there and as usual has come up with a group with interesting stories to tell,” the news release said. The event is free and refreshments will be served after the walk. More details will be announced next week. 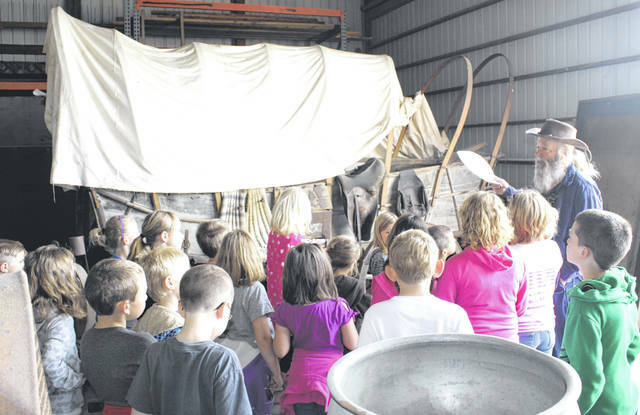 https://www.timesgazette.com/wp-content/uploads/sites/33/2018/09/web1_Wagon-1.jpgGary Hochenberger explains the Conestoga wagon to second-graders during their annual visit with the Greenfield Historical Society. School programs like this are made possible through fundraisers like the society’s annual History Day.